In our previous blog we created a simple _Layout.cshtml file that does not have any markup just to make things simple. In this blog we will use Bootstrap to make the layout look more professional and responsive, so that it can be viewed in any screen size. The previous layout looks like screenshot below. The Bootstrap version will look like the screenshot below. 3. Now we are ready to add the header navigation to the _Layout.cshtml file, which is the layout specified as the default layout in the _ViewStart.cshtml file. The code above defines the viewpoint as the device-width, a viewport is the width of the screen used to determine how bootstrap will display the elements on the screen. The device-width viewport means that the elements will be render to the screen's device width. The rest of the code just renders all the style bundles that we've defined in the BundleConfig.cs file. 5. Once we have the head section defined we can define the header section of the layout. <a class="nav-link dropdown-toggle" href="#" id="navbarDropdown" role="button"
6. The following section defines the menu when the screen gets really small and the elements have to be stacked because it does not have the width to display everything horizontally. 7. Now we want to define the actual navigation bar, type in the following code to define the "Home", "About","Contact" tabs, and the "Products" drop down. 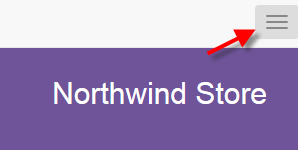 Like everything else in bootstrap we just have to call class "navbar-collapse collapse" and nest the div with the <ul> element with class "nav navbar-nav" and bootstrap picks it up applies the stylesheets and functionalities automatically. That's the great thing about bootstrap. It makes things easy, but the bad thing is a lot of the sites nowadays have the same bootstrapy look and feel to them. But it's great if you want to throw something together quickly and make it look decent. 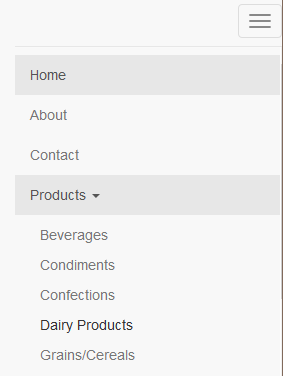 And the following code defines the "Products" dropdown menu. 8. Now we want to add a jumbotron to make the navigation stand out a little bit. 9. To style the jumbotron we have to create our own stylesheet so that it does not interfere with the default bootstrap styles. So create a new css file in the ~/Content folder and give it the name Styles.css. The code above defines the margin for the navbar and the jumbotron, it also set the text color and background color for the jumbotron. For some reason, this line in the BundleConfig.cs file is breaking the responsive navigation. If I comment it out, it works but I really need to add custom styles. Stephanie, I am running the guide just as you are and am coming across the same problem. This is a fantastic guide but, maybe it is becoming dated? Still learning of course but, I am just going to continue without this functionality. I am glad the users are helping each other. As I've mentioned before, I have a daytime job. So I don't have time to maintain this blog. My goal for this blog is to spark you interest in coding and web development. I am really impressed with the self-help. I never claimed to be an expert. I just hope I had more time to answer your questions. Keep up with the community help. I encourage it. What I say is not the authority. That's the fun of software development. It's wide open. It's a craft. Its not just about the money.